Three high-interdependent aspects should be highlighted and qualified. First, we have to emphasize the difference of the current situation with respect to the price spike in 2008. 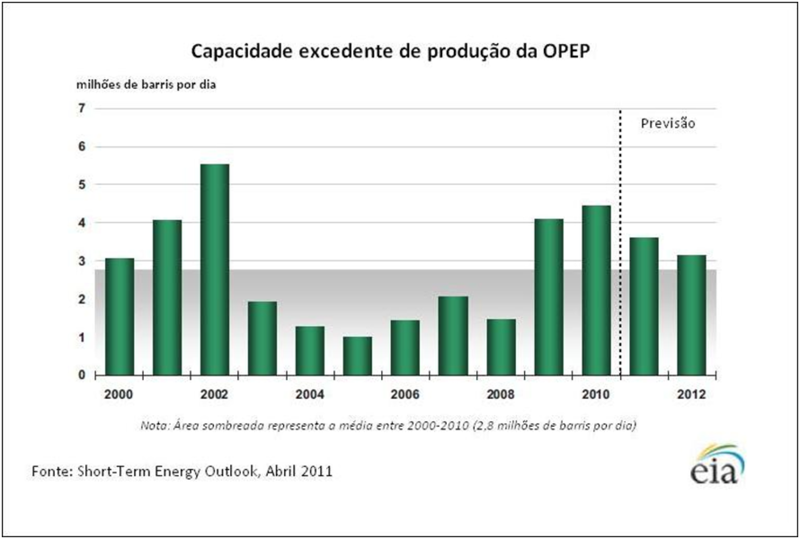 Three years ago the conditions of the global oil industry were determined especially by limited conditions of supply. An illustration of this aspect is in Figure 1. You may observe that the excess production capacity in OPEC countries had very low levels in 2008; at the end of 2010, such capacity exceeded the level of 4 million barrels / day in the OPEC countries. That is, in early 2011, the factors related to the structure of supply are not enough to explain the price fluctuations. Second, the growing importance of futures market on the behavior of prices, especially in times of uncertainty, is noticeable. It is possible to see that the short-term speculative movements have expanded significantly the volume of transactions in the futures market, which feeds back the upward trend. However, it should also be noted that the number of contracts has increased over the past year. This shows their growing importance to the formation process of expectations and prices in the oil industry. Moreover, the speculative activity in these markets also grows due to the use of commodity funds as financial assets. In this sense, the continuous unlinking of the growing demand in relation to physical market (oil futures market) is noticeable. Therefore, it is important to note that in the physical market, from 2005 to 2010, the world demand is growing at an average annual rate of just below 2% p.a. In the futures market, in the same period, demand for contracts was multiplied by five (Figure 2). Earlier this year, this number has grown quite significantly due to the crisis in the Arab world and sources of uncertainty mentioned above, recording an increase of 25% in April 2011 in comparison with the volume traded in December 2010. Third, in relation to oil importer countries, the persistence of a high level of prices translates into inflation effects arising from increases in prices of oil byproducts. In contrast, regarding exporting countries, this situation allows the appropriation of further significant oil revenue. The so-called differential incomes arise from the different cost structures between producers manufacturing similar goods. They are derived from economic advantage of certain production units in relation to others operating in the industry. The search for the appropriation of income is the main driving force for companies operating in the oil industry, given that prices are formed in this market can be located far above production costs. Hence we have the State’s concern in any producing country to create mechanisms for the distribution of income. When prices rise, the share of oil revenues generated also increases. In the case of exporting countries, the increase in value of exports is very significant and leads to a transfer of financial flows from the importing countries. To clearly illustrate this argument, we can assess the amount of extraordinary oil revenues due to the high prices over the first four months of the year. Taking as hypothesis that i) extraordinary income is calculated by the difference between the average value of production and ii) the 2010 production remained constant; it is possible to note that OPEC countries appropriates about US$ 670 million daily. That is, throughout 2011 these countries accumulated additional revenue of about US$ 80 billion. It should be noted that the key to these countries should be the capacity for rational use of financial resources from exhaustible resources and volatile prices. With his elegant structural economic analysis, Celso Furtado highlighted in his Ensaios sobre a Venezuela , in particular the text “El Desarrollo reciente de la economia venezoelana”, from 1957, the crucial problem for countries with abundant natural resources regarding the right guidance on public spending. Furtado considers essentially a form of appropriation and use of foreign exchanges of exporting from countries with large natural resources, seeking to turn them into programs and projects for economic and social development. After more than half a century, the approach of the Master is prevailing. 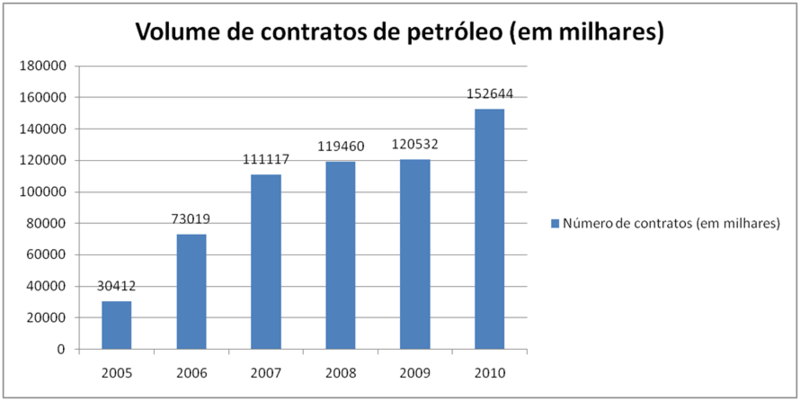 (*) The author wishes to thank Ana Tavares, GEE/IE/UFRJ research assistant, for the statistical and graphical data. See Furtado, Celso, Ensaios Sobre a Venezuela: Subdesenvolvimento com Abundância de Divisas, Editora Contraponto, 2008.